"Kindness is a language that the deaf can hear and the blind can see." I heard this quote on the radio recently and did a little research to discover who said it originally. Some sources reveal that it's a modification of a quote by Mark Twain. Regardless of the source, however, the phrase rings with absolutely truth! Kindness transcends any differences among human beings and brings us all closer. In this blog post I've compiled a list of 10 amazing gifts that encourage the spread of kindness among us! 1. "In a world where you can be anything, be kind" rustic framed art. This rustic framed sign is the perfect addition to your home decor and makes a great gift. The message is as beautiful as the handmade barnwood frame. 2. 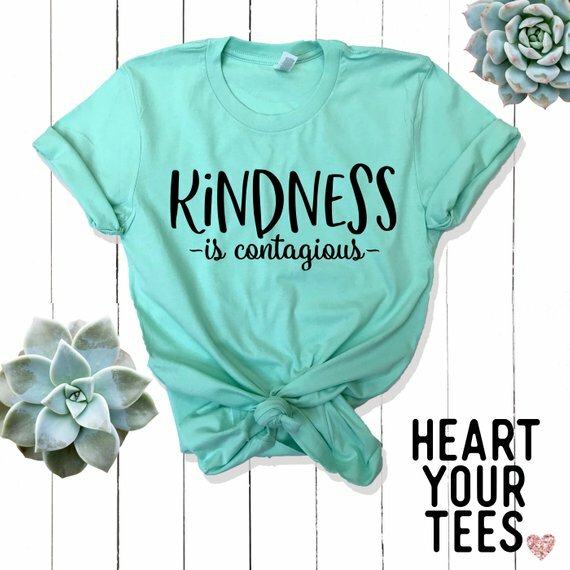 "Kindness is Contagious" T-Shirt. This great shirt, available in a variety of colors and styles, can go far to help promote anti-bullying at school. 3. Kindness Pendant: I absolutely love this gorgeous antique-looking pendant! It features the very quote that inspired this blog post! 4. Kindness and Affirmation Rocks. These hand-painted rocks are wonderful gifts for family, friends, and even those hard-to-shop-for people. They offer words of encouragement, affirmation, and faith. There are many to choose from and you can even request a custom painted rock with a special phrase or name. 5. "You Make the World a Better Place" cards. What a cute idea! This is a set of 10 little cards that you can carry around and hand out whenever you want to commit a Random Act of Kindness! 6. Affirmation Stones. Give someone a lasting gift that says "Thank you" or "Be kind" or any phrase you wish! These beautiful, hand-painted affirmation stones are unique and meaningful. 7. "Let Kindness Ripple" mug. The meaning behind this touching phrase is simple: random acts of kindness create a ripple effect that continue beyond your line of sight. This mug would make a great gift for a coworker or a coffee lover. 8. "You are Awesome" painted rocks. Tell someone they are simply AWESOME with these hand-painted rocks! Perfect for teachers, therapists, babysitters, and basically anyone who deserves to know how special they are. 9. 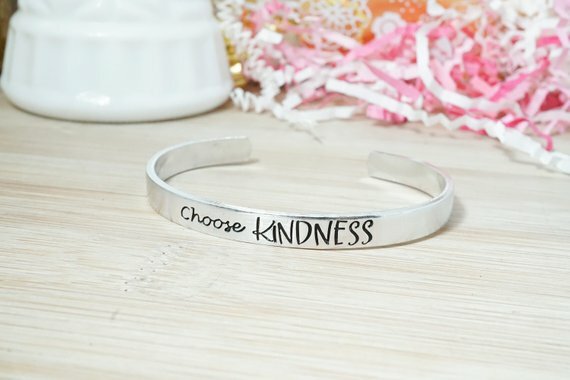 Choose Kindness Bracelet. This gorgeous aluminum cuff bracelet is hand-stamped and would be a perfect back-to-school gift. It reminds you to make one of the greatest choices: to be kind. 10. "Every Tribe, Tongue, and Nation" Painted Paperweight. This hand-painted paperweight presents a visual image of a world united by kindness! Perfect as an accent for office or home decor. Looking for more Kindness-Inspired gifts? Visit my shop HERE and shop for items that prove that KINDNESS MATTERS! Please join my email list HERE for a coupon!